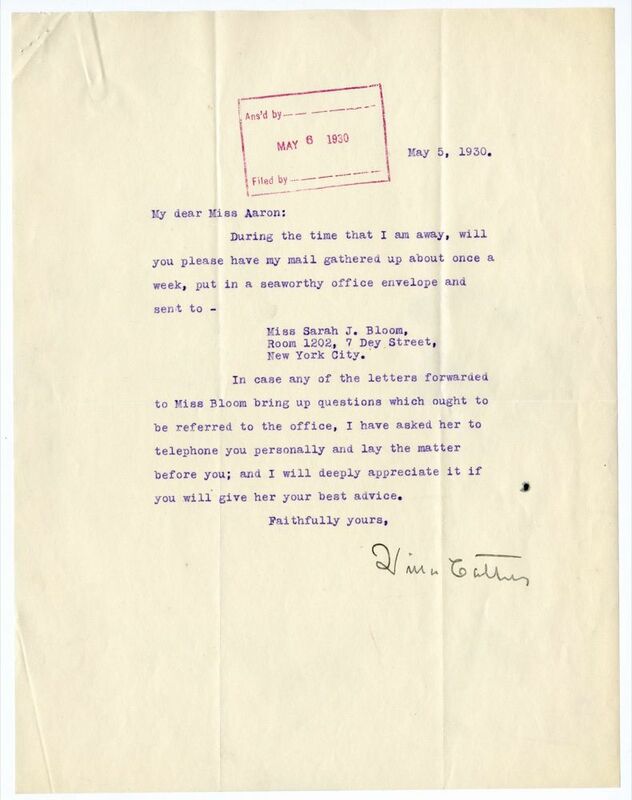 In case any of the letters forwarded to Miss Bloom bring up questions which ought to be referred to the office, I have asked her to telephone you personally and lay the matter before you; and I will deeply appreciate it if you will give her your best advice. Cather and Edith Lewis departed for France on 14 May 1930 on RMS Berengaria. On 27 September 1930, they departed Southampton, England, on the RMS Empress of France for Quebec City, Canada, arriving 3 October 1930. On 7 May 1930, Aaron wrote that she would follow Cather's instructions and hoped Cather would enjoy reading Dashiell Hammett's The Maltese Falcon and Red Harvest.